Last night we tried our first vegan pizza ever. We were a little hesitating, since we aren’t big fans of faux meats, but it’s been forever since we’ve had pizza, and to be honest, it was one of the things I’ve been missing since having gone vegan. 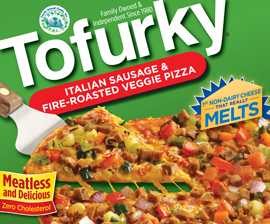 We first saw the Tofurky pizzas at Viva Vegan but since it’s a bit of a ride from our place, we didn’t want it to thaw out too much. Fleur Sauvage recently got these so we decided to give it a try. Well, it was a hit! It’s got Daiya cheese, and it really melted on the pizza. The blend of spices in the sauce was pretty amazing, and we barely noticed the faux sausage. There was some zucchini in the toppings (not a fan of it cooked – I’d rather eat it raw with vegan taziki sauce, mmm! ), but this didn’t bother me too much either. However, for $10, it was a bit on the small side – I thought I’d have enough for lunch tomorrow, but it was barely enough for just the two of us. I keep on learning new recipes, and I came up with one just last night. It was a roaring success, to say the least. What started out as a test gave great results. 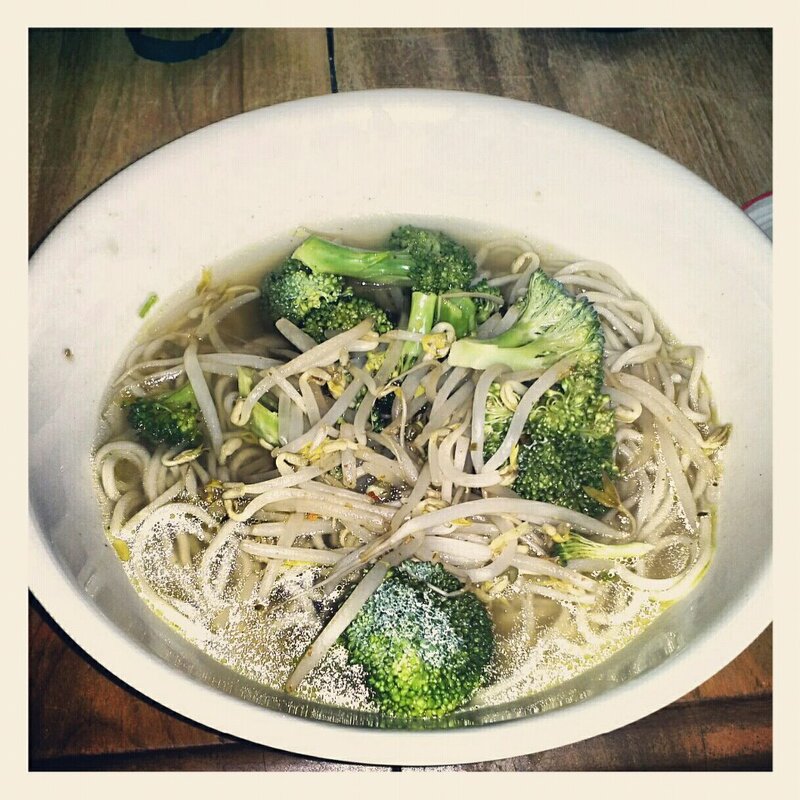 Prepare veggie broth if not already on hand. Keep some on the side to stir fry the broccoli & sprouted beans. Add chopped green onion to veggie broth. Bring to a boil. Meanwhile, stir fry the broccoli and sprouted beans in the soy sauce, veggie broth and hot sauce for about 5 minutes maximum. Add the stir-fried veggies to the broth (including the ‘juice’). Cook with the ramen noodles for 2-3 minutes. This makes a lot of soup, so you can either serve it as a meal (approx. 3 portions) or as an a side dish (approx 6 portions). You could probably add some marinated tofu in there as well, but I found it to be quite filling on its own!